This article is a short summary of Poochy & Yoshi's Woolly World. Poochy & Yoshi's Woolly World is a Nintendo 3DS port of the Wii U title Yoshi's Woolly World. The game was released in Japan in January 2017, and in February 2017 worldwide. Poochy & Yoshi's Woolly World launched alongside a yarn Poochy amiibo, which was also included with bundles for the game. This version of the game features every stage available in the Wii U release, as well as additional new stages based on Poochy known as "Poochy Gold Rush", which replace the original bonus stages. In these stages players run along a set path toward the goal, collecting as many beads as possible. Another new feature for this version is the addition of Poochy Pups, small Poochy-like dogs that act as renewable eggs and help Yoshi find secrets by indication suspicious areas. The Poochy Pups will only appear while playing in Mellow Mode. Players can also scan the Poochy amiibo while playing a stage to have him appear and assist. Unlike the original, this version of the game will not include multiplayer. In addition to the in-game Yoshi patterns (including the amiibo patterns), players will also be able to create their own custom Yoshi patterns. The Yoshi pattern editor includes two both easy and advanced settings for creating Yoshi designs. Players can also share their patterns over StreetPass. As a bonus feature, this version contains 30 stop-motion animated shorts featuring Poochy and Yoshi, animated by Dwarf. Poochy & Yoshi's Woolly World runs at 60 frames per second when played on a New Nintendo 3DS system, and at 30 frames per second when playing on the original hardware. Japanese bundle featuring the Pink Yarn Yoshi and Poochy amiibo. ↑ 1.0 1.1 Nintendo 3DS Direct 2016.9.1 プレゼンテーション映像. Nintendo 公式チャンネル (YouTube; September 1, 2016). Retrieved September 1, 2016. ↑ 2.0 2.1 2.2 2.3 Nintendo 3DS Direct 9.1.2016. Nintendo (YouTube; September 1, 2016). Retrieved September 1, 2016. ↑ Nintendo 3DS Direct - 01.09.2016. Nintendo UK (YouTube; September 1, 2016). Retrieved September 1, 2016. 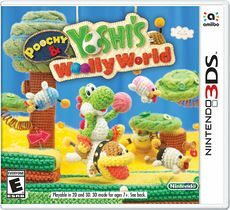 ↑ "Poochy & Yoshi’s Woolly World comes to #3DS on 04/02 in AU/NZ alongside a super-cute Poochy amiibo!" Nintendo AU NZ on Twitter (September 1, 2016). Retrieved September 1, 2016. ↑ Press release from Nintendo Korea (January 20, 2017). Retrieved January 21, 2017. ↑ 6.0 6.1 Poochy & Yoshi's Woolly World - Mellow mode, Poochy Gold Rush info. GoNintendo (December 9, 2016). Retrieved December 10, 2016. ↑ "While playing Poochy & #Yoshi's Woolly World you can tap in the lovely Poochy #amiibo to enlist the charming pup's help at any time!" Nintendo of Europe on Twitter (November 10, 2016). Retrieved November 10, 2016. ↑ 8.0 8.1 8.2 Poochy & Yoshi’s Woolly World to run at 60fps on New 3DS, 30fps on regular 3DS. Nintendo Wire (December 3, 2016). Retrieved December 4, 2016. ↑ 9.0 9.1 A Port Stuffed With Extras. Game Informer (December 9, 2016). Retrieved December 10, 2016. ↑ "In Poochy & Yoshi's Woolly World you can design your own #Yoshi patterns and use them in-game!" Nintendo of Europe on Twitter (November 10, 2016). Retrieved November 10, 2016. This page was last edited on 12 December 2017, at 23:36.